How to publish HTML5 flip book for iPhone? As iPhone has become popular among us, I think it's very necessary to make the flip book work on iPhone or other mobile devices. Could you show me how to publish flip books for iPhone? 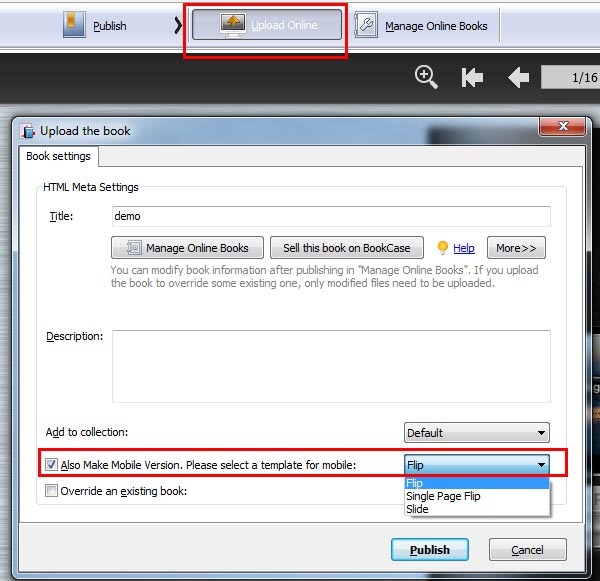 You can use A-PDF Flipbook Maker to publish HTML5 based flip book for mobile devices such as iPhone, iPad and Android. Beyond your imagination, this page flip software can help you transform PDF files to not only flash flip books for PC and Mac, but also HTML5 based versions for mobile devices at the same time. People can read your book on their iPhones, iPads, Android phones and tablets via browsers with ease. Launch A-PDF Flipbook Maker and import a PDF file from your computer. And in the main interface, customize the flipbook with various settings and featured functions. Click "Publish" button and choose "HTML" format, and enable "Also Make Mobile Version" option below. 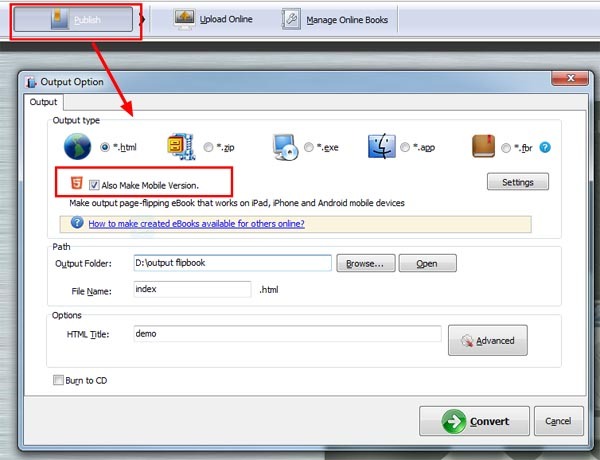 To enable your readers to read your book on iPhone and other mobile devices, you will need to upload it online first. After you publish both flash and HTML5 versions, upload all the output files to your server. Optionally, you can upload the flipbook to our server by using Online Service, and you can also make an HTML5 based mobile version for iPhone as well.